In the heart of Florence (5 - 10 min walk from major sights, such as Duomo, Palazzo Vecchio), right next to the main railway station Santa Maria Novella (5 min on foot) and next to the Fortezza da Basso! Cheap rates will offer you clean, comfortable and safe rooms and apartments, where you can safely store your luggage for free in the corridor in cases of an early arrival or late check-out! 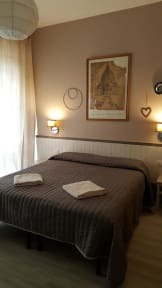 Giglio is a small guesthouse that offers its guests an affordable but comfortable and clean accommodation. In order to maintain a good price we ask your cooperation in make the check in on your own by following the instructions that are provided in the confirmation mail of your booking. Check-in is easy and can be done at any time of the day. 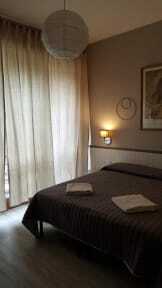 At the time of booking, we will send you an email with an access code for independent access to your room. Please do not forget to bring your access code with you. The rooms will be available from 1.00 pm. No curfew, come and leave as you wish! Imagine a nice dinner in a family-owned restaurant, where 10 euro buys you a three-course meal with a glass of wine? Or a cappuccino at only 1.20 euro sitting down in one of the oldest cafes in Florence? What about a hearty Panino with typical Tuscan salami and cheese at only 2.50 euro, so big you can hardly eat it? Would you like to know how to avoid queues at uffizi in high-season or where to have the best view of Florence? No, it's not booking by the internet and it's not Piazzale Michelangelo. Come and see for yourselves! We'll also give you a free map and a full list of all time and money saving tips!